As I pilot my submarine around the sea of beer sites I'm finding a lot of exotic and colorful creatures. Beer might last the rest of this week. 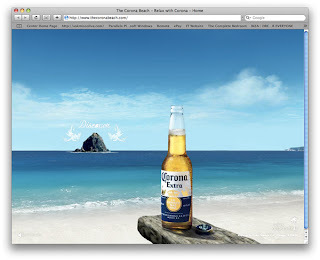 The Corona Beach site is based on the simple principle of relaxing. 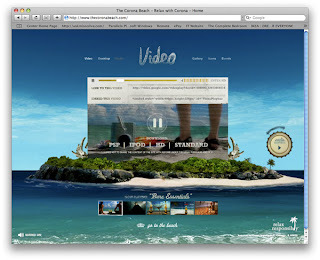 Perfectly in-sync with their advertising, you are placed on a virtual beach that you can click around, and move the camera to the right and left. There are a few simple activities that garner no award other than to waste time (at least I think - having done them all I didn't find anything new as a result). My favorite being this one. 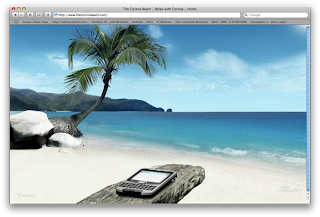 Where you click and throw your phone into the ocean. KISS. The content is minimal, except for a section of commercials and wallpapers. I'm showing this because I'm curious about their presentation of commercials. They offer an embed link, a PSP version, a IPOD version, HD and Standard download versions. For a commercial. I would love so much to see the stats on how many people downloaded these to view later...or forever. I'm being cynical, but if the stats were favorable I'd be overjoyed.